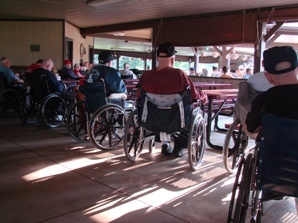 United States veterans deserve high-quality nursing home care when they are disabled or elderly. Some veterans seek this care in government-run nursing homes and long term care facilities. Like other types of nursing homes, government-run nursing homes for veterans must comply with safety guidelines to prevent nursing home abuse and neglect injuries. Reported pain within the past five days. 32.64% of residents in VA nursing homes reported pain within the previous five days compared with just 5.59% of residents in private nursing homes. Use of anti-psychotic medication. Anti-psychotic medication creates an increased risk of death for older adults with dementia. These medications should not be used to control nursing home residents’ behavior and should only be used with a doctor’s prescription. 20.89% of residents in VA nursing homes received anti-psychotic medications compared to 15.48% in private nursing homes. Marked decrease in ability to perform activities of daily living. This includes things such as bathing, eating, and using the bathroom. Residents in VA nursing homes had a 16.7% decrease in their ability to perform daily living activities compared to a 14.99% decrease for residents in private nursing homes. Catheters left in their bladders. Catheters that are left in can lead to serious urinary tract or blood infections, related complications, and death. 11.96% of residents in veterans’ nursing homes had catheters left in their bladders compared to 1.83% of residents in private nursing homes. Bedsores. Bedsores can result in pain and dangerous, life-threatening infections. These injuries may be prevented if a person is repositioned regularly and provided with cushions. 8.51% of residents in VA nursing homes experienced bedsores compared with 5.57% of residents in private nursing homes. The Department of Veterans Affairs assigns a star rating of one (lowest) to four (highest) for 133 veterans’ nursing home facilities throughout the country. As of December 31, 2017, 60 of the 133 facilities received the VA’s lowest rating of one star. This included one facility in Kentucky. Your loved one deserves to be treated with dignity and respect. If he was instead hurt by nursing home negligence or abuse, we encourage you to contact our experienced Kentucky nursing home injury lawyers as soon as possible. Let us help you help your loved one. We would be happy to review your case, free of charge, and to talk to you about your legal options. Please contact us today via this website or call us at any time to learn more. What Can You Expect From a Kentucky Nursing Home?